No matter if you have an old vintage home and want to repair a crumbling brick corner, or if you need a new brick chimney built from scratch, we will take care of your every need. If it’s brick, Turnbull Masonry is qualified to make it perfect. In fact, our brickwork is built to last. Bricks are often selected for their durability, but without the right care, your bricks will eventually begin to show signs of wear and tear. The great thing about bricks is that you can often repair problems instead of replacing the entire structure. On the other hand, if problems are allowed to build up, your brickwork will start to incur structural damage. Allow our team of highly qualified professionals to identify and complete any necessary brick repair and maintenance so that you can save money and avoid big problems down the road. If you are looking to recreate an existing or new brick project, we have you covered. Our work is completed carefully and our proven process will leave you 100% satisfied. If you want to build a brick porch, brick walkway, or indoor brick wall, we will create a stunning masterpiece, built to withstand the test of time. Brick masonry is without a doubt timeless. Brick adds beauty, value, and character to any space. 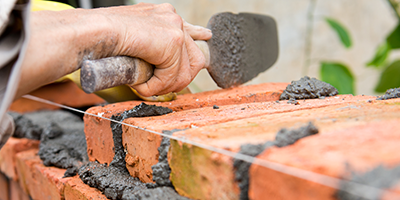 Do you want to add bricks to your home, or repair bricks that are cracked or crumbling? At Turnbull Masonry we provide a wide variety of brick services, including brick repair, brick replacement, and brick cleaning. Brick repair in Toronto should only be handled by an expert mason with the knowledge and experience to handle any job correctly. There’s a reason our clients rate us number one for customer service! We provide quality brickwork at an affordable price, for projects both big and small. At Turnbull Masonry we go above and beyond for every job that we do, making sure clients are more than satisfied. After all, you want to feel safe and comfortable in your home. We also offer commercial brick work, maintenance and repairs. Our teams of experts restore everything from strip malls and schools to condominium corporations. Our experience grants us valuable insight necessary to understand what a certain project needs right from the get-go. We get things right the first time around, producing excellent projects with efficiency. For commercial and private properties, Turnbull Masonry provides the best brick cleaning, brick repair and rebuilds around. We work hard to deliver and adhere to your budget. Turnbull Masonry has become one of the most trusted names in the masonry industry. Using state-of-the-art equipment, and an eye for style we continually wow our clients. We would love to impress you with our unmatched brickwork and brick repair, all of which come with our signature quality satisfaction guarantee.